Many years ago I was part of a recipe swap….I may have mentioned it before. This recipe came to me during “Asian Week”. I love cooking ethnic food with new flavors and taste! As soon as I saw the recipe I was making I was so excited! I knew it was something Joe would enjoy too. I wasn’t sure about my girls because once I looked over the ingredients there was some “spice”! The recipe came from Sara at A Taste of Home Cooking and it did not disappoint! I will be adding this to our rotation. It was super easy…..and unbelievably good! The combo of flavors in this dish were literally mouth watering! It has just the right amount of spice….and Olivia LOVED it, but Ava did not (hey — 1 of 2 isn’t too bad) and Joe and I both agreed it was something I’d make again…and SOON! Sara recommended using white rice with it, but I prefer fried (and my waist proves it) with any of my Chinese food that I make or take out! But I know it would be just as delicious with any kind of rice you choose! THANK YOU, SARA!! In a medium bowl, whisk the egg white with the cornstarch, sugar, salt and pepper until a paste forms. Set the shrimp aside to marinate for 10 minutes. In a small bowl, combine the garlic, ginger and red pepper flakes; set aside. Heat a large, heavy skillet over high heat for 3 minutes. Add the oil and swirl to coat the bottom of the skillet. Add the shrimp and the white and light green scallion pieces and stir to coat with the oil. Cook, stirring and scraping up any brown bits from the bottom of the skillet, until the shrimp are almost cooked through, about 2 minutes. Add the garlic mixture and the dark green scallion pieces and cook, stirring, until the shrimp are cooked through, about 1 minute more. 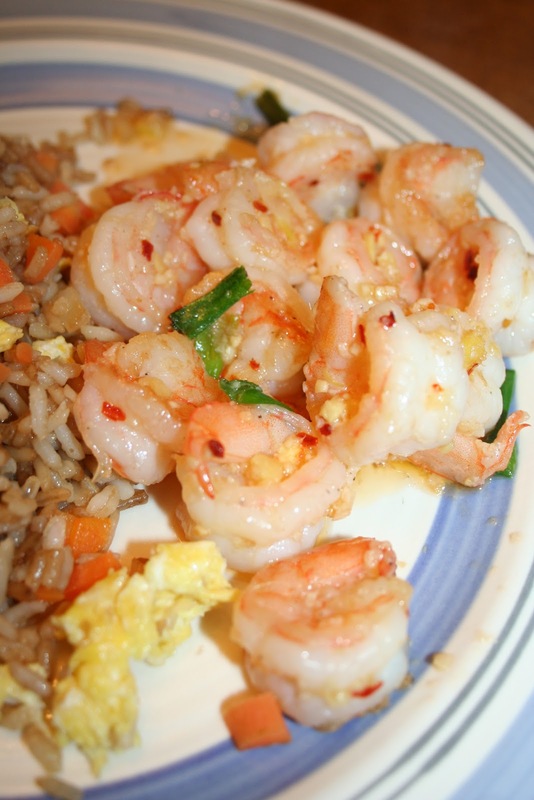 Transfer the shrimp to a platter and serve with rice.